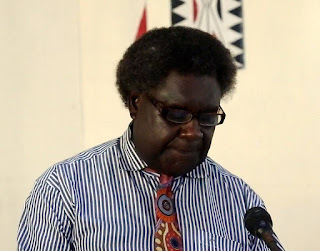 The ABG Minister for Public Service, ROBERT HAMAL SAWA last week appealed to all Bougainville Public servants to put their heads together and work in unity as Bougainville prepares for the Referendum to Independence and beyond. Speaking to the Bougainville Public Servants at HAHELA, MR SAWA first thanked them for delivering basic services to the people of Bougainville in Health, Education, Community Government and other government service in 2018. The Minister said that the Public Service is the main driver of policy development and service delivery. As an institution it must be seen to be effective, neutral serving and answerable to the government of the day as well as the general public to whom it is mandated to serve. He said that the Public service does not decide on policies but implements Government Policies that has been decided and put in place by the Bougainville Executive Council and the Parliament of Bougainville. For this reason it must assume a central role in our government implementation agency. Minister SAWA also thanked those public servants who did just that and called on others to pull up their socks in 2019.